As the name suggests, Native American war clubs were developed for use in battles. Native Americans would use hardwood to carve war clubs for the purpose of knocking off the enemy’s head. The hitting part was rounded. War clubs are one of the oldest weapons used by the Native Americans. They used young trees to make the toughest war clubs but should be disposed of when the wood starts to decompose. War clubs cover a variety of weapons that Native American tribes used. Simple clubbing weapons such as stone clubs, wooden clubs, and heavy bones were the first kinds of war clubs. Other examples of simple war clubs were the rabbit stick or throwing stick and the jawbone club. The skills of Native Americans developed and war clubs were then designed with sharpened stone edges and wooden handles that could be used as weapons or tools for throwing or close battles. Although war clubs were made with stone heads, this weapon was very deadly. Upon the arrival of the White Settlers and Traders like the Europeans, new technologies and ideas were introduced. Recent types of war clubs were already made of metals such as steel and iron unlike the previous horn, bone, stone and hardened woods. 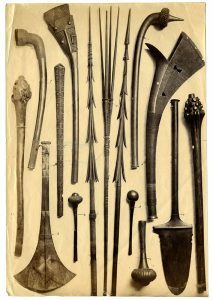 Native American war clubs were categorized into five major categories based on their style and design. These are the gun-shaped style war clubs, ball-head style war clubs, pick-ax style war clubs, hatchet-ax style war clubs and bludgeoning style war clubs. Tomahawks. The Tomahawk was a hatchet ax style war club weapon. It had a wooden handle and the head was made of metal, bone or stone. It could be used as a throwing weapon or as a close combat fighting tool. Gunstock Club. The gunstock war club was a native weapon named as such for its similar appearance as rifles and wooden stocks of muskets. Gunstock clubs were mostly used by Eastern Woodland, Northern and Central Plain tribes in the 18th to 19th centuries. Ball Clubs. Stone ball war clubs were indigenous but deadly weapons used with force in attacking an opponent. Stone ball war clubs was made of free-moving round-headed stone covered with rawhide or heavy buckskin connected to a wooden handle. It had varied sizes but usually smaller than wooden ball clubs. Jawbone Club. In some ways, the jawbone club was in fact, unique to some tribes. This unusual weapon was made of buffalo or horse’s jawbone. The hitting edge was sharpened leaving the teeth of the jawbone intact. Some tribes would even polish the animal’s teeth to give the jawbone war club an artistic appeal. Moreover, they would paint and decorate it with ornaments like feathers and hide. It was used for close battles and can cut the chest of the enemy. Throwing Sticks or Rabbit Sticks. 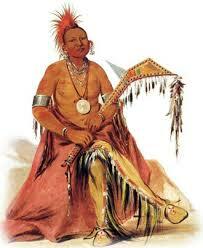 Rabbit Sticks or throwing sticks were one of the known clubs used by the Native Americans. Basically, it was a wooden club or short rod that had a curved wooden club or pointed wooden shaft similar to that of a boomerang weapon.